It’s late October, the time of year when autumn winds and lengthening shadows usher in the spookiest night of the year, when imaginary specters and ghostly ghouls seem to be lurking behind every doorway and darkened corridor. Ouija boards are retrieved from back closets and attic trunks, and lighted pumpkins glow from inside darkened windowpanes. On doorsteps, trick-or-treaters suddenly appear. Houdini was born Erich Weiss in Budapest, Hungary, on March 24, 1874. Like many Europeans, his family immigrated to America at the turn of the century. As a child, Weiss grew up in awe of France’s great magician, Houdin (1804-71), whom many credit as the founder of modern-day magic. Houdin (pronounced “oo-Dan”) preceded Houdini by a generation. Weiss eventually took his stage name from the famous magician. Later, Houdini turned on his idol, vilifying him in a book titled, The Unmasking of Robert Houdin. Houdini took pride in exposing what he believed to be fraudulent behavior, especially those of fake spiritualists. So great was his desire to root out these fakes, he would often disguise himself and attend a seance in order to expose the phony oracle. Daredevils had become the new fad in entertainment. They risked their lives dancing on airplane wings, walking tightropes high above cities and plunging over Niagara Falls in barrels. The more death-defying the act, the greater the adulation. Time was ripe for someone like Houdini-someone who could challenge the Grim Reaper, look death in the face and survive. 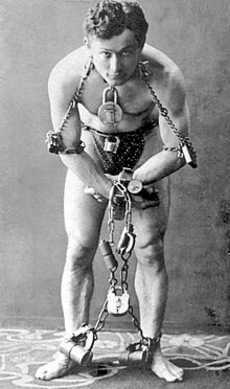 Houdini, the escape artist, honed his skills and incorporated them into his new death-defying acts: he dangled in a straitjacket over mid-Manhattan; he was handcuffed, chained and encased in a tank of water; he was handcuffed to the wing of a plane; he was locked in a coffin-like crate and dropped overboard into the sea; and he was chained and handcuffed and thrown into Boston’s Charles River. Houdini recognized the public’s thrill and fascination with close calls, noting, “The easiest way to attract a crowd is to risk sudden death.” He even waited longer than he had to when freeing himself just to increase the audience’s anticipation. According to his friends, Houdini’s love of notoriety was only outpaced by his cheapness. The escape artist had a reputation for not paying his fair share of the bill when he dined out with pals. On one occasion, as the story goes, a conjurer called Mayenberg managed to get the better of him. After lunching in a posh restaurant with Houdini and a number of other vaudeville artists, Mayenberg turned to the escape artist and asked, “Would you like to see a new trick, Harry? Lay your hands flat on the table, with your palms down.” Houdini did as he was told. The conjurer then filled two large glasses with expensive red wine and carefully balanced one on each of Houdini’s hands. “Now, let’s see you get out of that without paying the bill,” Mayenberg cried out as he and his pals beat a hasty retreat for the door. How did Houdini do his tricks? Some claimed he hid a key under a denture plate or a fold in his skin. Whatever it was, some of Houdini’s feats were nothing short of miraculous. Houdini angered many of his fellow magicians by taking the secrets of his best tricks to the grave. About two months before his death, Houdini staged his most amazing feat. On Aug. 5, 1926, he was submerged underwater in an airtight iron casket for one hour and 31 minutes. He claimed to use no trick or gimmick. The secret, he said, was simply to stay calm, stay still and take shallow breaths. On Oct. 22, 1926, a college student visited his dressing room in Montreal. Houdini had publicly claimed that he could resist the hardest blow struck to his abdomen. The young student challenged Houdini’s claim. Houdini accepted the challenge, but the student began punching before Houdini could brace himself. The punches ruptured his appendix. He went on stage the next day, headed to Detroit with a fever of 102 degrees, performed again and finally collapsed. An operation was performed, but it came too late to save him; he died on Halloween night. Houdini’s wife, Bess, along with his good friend Sir Arthur Conan Doyle, participated in seances in an attempt to make contact with the escape artist, who promised to reach out to them from the afterlife, but to no avail. Since then, on Halloween night, every Ouija board enthusiast has tried in vain to establish contact with the great Houdini. When I was a kid, every Halloween my friends and family would gather around our Ouija board and attempt to make contact with the spirit of Houdini. Aunt Hattie was a whiz at working the Ouija board. She knew just how to entice us with cryptic messages that made the hairs on the back of our neck stand on end. At the stroke of midnight, we’d all gather around the table, each of us placing one finger on the Ouija. Although each of us swore we weren’t moving the wooden oracle, it danced merrily around the board spelling out nonsensical messages. Then, just as quickly and mysteriously as it had arrived, the spirited Ouija would depart, which suspiciously always seemed to coincide with Aunt Hattie’s bedtime. We never succeeded in making contact with the great Houdini, nor has anyone else, for that matter, but his curious legacy, along with the mysterious Ouija board, continues to fascinate and entertain Americans down through the decades.